Went on a service call the other day on a Frigidaire dryer with the complaint of being very noisy and then stopped tumbling altogether. I opened up the dryer and saw that the back of the drum had actually dropped down several inches. Hmm, this was weird. Looking between the back of the drum and the heater can with my flashlight, I saw that the drum bearing had broken clean off! Incidentally, for instructions and pictures on disassembling this dryer as well as other dryer brands, see this illuminating tome on dryer disassembly. Anyway, when the bearing on this dryer needs to be replaced, it makes one helluva racket. The noise will go on, getting progressively louder and more skull-piercing, for several weeks before some type of catastrophic failure occurs. I don’t know how they could put up with the noise all that time. When the dryer finally stopped working altogether, then it was time to call for service. Enter the Samurai. To get an idea of how long the dryer must’ve been screeching and howling, check out how the round drum bearing ball got lathed into a cylinder by the worn bearing ball socket. 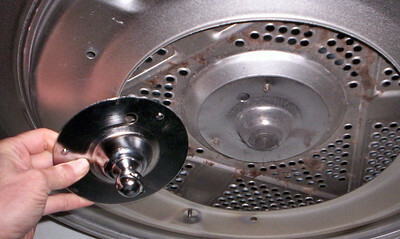 Anyway, I installed a brand-spanking new drum bearing kit and harmony was restored to both the dryer and the household. 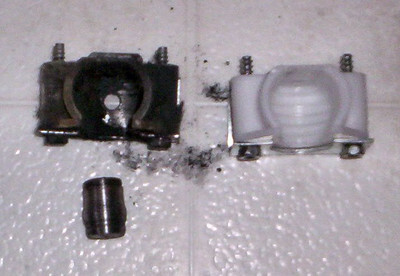 This entry was posted in Dryer Repair on October 24, 2005 by Samurai Appliance Repair Man.